One of the most challenging aspects of nature photography is shooting the subject of wildflowers successfully. There are many aspects to learn and nothing is more rewarding when the outcome is positive. I have made many mistakes over the past few years shooting wildflowers and I hope to pass some of this wisdom down to other photographers. Having the right tools in your camera bag is essential to capturing impact in your images. 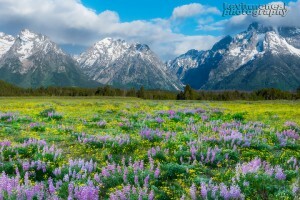 The first goal when shooting wildflowers is to capture vibrancy and color in the wildflowers. When we look at images of wildflowers the first thing that captures our attention about these images is the color that seems to “pop “off the page. You especially want to have a lot of impact in the foreground to grab your viewer’s attention. Therefore producing wildflower images that contain good color rendition and vibrancy are vital to the overall goal. To make sure that you are able to reproduce the colors you need a filter that can realistically take advantage of the bold colors and then allow it to come through in the image. The filter I turn to in all my wildflower images is the LB ColorCombo Polarizer. The filter offers two successful qualities in an image that boost impact. The first aspect in the filter is the color intensifier so that images taken with the filter will consist of vibrant and bold colors. In many nature scenes this might not be vital but when shooting wildflowers this is critical. The essential component to shooting flowers is color. While improving color saturation it also renders the image with a natural color balance so that what you see is what you get. I have tried other filters in the past and found I was getting unusual colorcasts when I used their filters. Not only did I receive a colorcast with other filters but often the colors were also muted. With the Singh-Ray LB ColorCombo the results are excellent when it comes to reproducing accurate results. The second component contained within the LB ColorCombo that gives it a huge advantage over other similar filters is that it contains a warming polarizer within the same filter. In the past you would have to stack filters to get these same results. Shooting wildflowers there is always a certain mood you are looking to convey; I will always lean towards a warmer tone in the image as this really attracts more viewers to your image then cooler tones. So having a warmer within the polarizer I can really take advantage of this as well as gets the best of the warmer tones in the image like the reds and yellows. Thus, the color is accentuated yet remains natural in its overall tone. One of the arguments I often hear is that I can recapture that color in RAW images so why is it necessary to have this filter. And it always comes back to the notion that it is vital to render the image as close as possible to how the scene was originally. You can add saturation and vibrancy later in post processing but the side effect to that is that you are pulling pixels from the image and thus destroying the image. This is especially prevalent in the shadow areas of an image. The effects become very visible when enlarging an image for larger print. When it comes to reproducing colors through RAW the images maintain their vibrancy without really having to increase the saturation past higher levels. Another advantage I have noticed with the LB ColorCombo polarizer is the image rendered from the filter remains sharp throughout. With other filters I have noticed a dramatic reduction in quality pertaining to sharpness. This is critical when shooting something in the foreground close to the lens. Whenever shooting wildflowers there is always a fine balance between ISO and shutter speed. In the past I have had to shoot without a filter to capture the flowers without movement. The use of other filters has decreased the shutter speed and not allowed me to capture sharpness and detail in the foreground flowers. Shooting wildflowers with success is much easier now with the newer LB ColorCombo being one stop faster combined with newer cameras having the ability to shoot higher ISO’s with fewer noise pixels. With the advantages of clarity, color rendition, and color saturation being natural and true to the subject when shooting wildflowers the use of the LB ColorCombo is a definite asset in your arsenal of photography tools.